At the heart of Gothenburg, dividing the old town into the former districts of Inom Vallgraven (left) and Nordstaden (right), runs Ostra Hamnkanalen. The canal was created in 1620-22, during which time the new city was founded in 1621. An earlier settlement in the vicinity had been named Gothenburg in 1603 but had been destroyed by Danish troops in 1611. The first bridge was completed in 1624, though the current (Fontanbron) was only opened for traffic in 1913. The central square was known as Stora torget before it was renamed Gustaf Adolfs torg in 1854. The city hall (right) was first completed in 1670-72 to a design by the architect Nicodemus Tessin the Elder, though the current facade is from 1814-17. It was completed by Jonas Hagberg on the basis of a design begun by Carl Wilhelm Carlberg. The tower at the back belongs to the German Church. Kronhuset is one of the oldest buildings in Gothenburg and was built in 1643-54 as a storage and artillery building. The original design was probably by architect Simon de la Vallée, though construction was stopped already in the first year due to a lack of funds. It was only a single-storey building before work resumed in 1648. The Swedish Parliament met here in 1660. The German church of Gothenburg was originally a wooden building that had been moved from the previous settlement of Nya Lodose, which was first established in 1473. A new church in Dutch brick was completed in 1648, with a decorative spire that was added about 20 years later. This church was destroyed in a fire already in 1669. A new one was inaugurated in 1672 though the tower was only completed in 1698. A second fire struck in 1746, though some of the walls could this time be reused. The new tower was finally completed in 1783 to a design by Carl Fredrik Adelcrantz. The building on the left was completed in 1753 and was designed to harmonise with the neighbouring Swedish East India Company by the same architect, Bengt Wilhelm Carlberg. 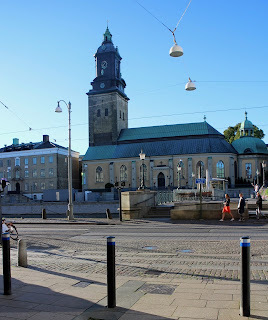 The main church of Gothenburg was also originally in wood and was first built in 1621. A more permanent structure was built in 1633 and was designated Gothenburg cathedral in the 1680s. It was rebuilt after a fire in 1721 but burned to the ground again in 1802. The current cathedral was built in 1804-15 to a design by architect Carl Wilhelm Carlberg, though the tower was only in completed in 1827. Several of the buildings near the cathedral were originally built in the early 19th century, including the house on the right, which has been dated to 1813. The black roof with dormer windows were apparently added during a rebuilding in 1914. The white building on the corner of Västra hamngatan was originally a two-storey house from 1810, with third storey and new facade dating to 1869. The red stone facade on the left is a later addition to the area. it was built by architect Isak Gustaf Claeson for Skånes Enskilda Bank in 1907. The exchange was built in 1844-40 to a design by the architect Pehr Johan Ekman. 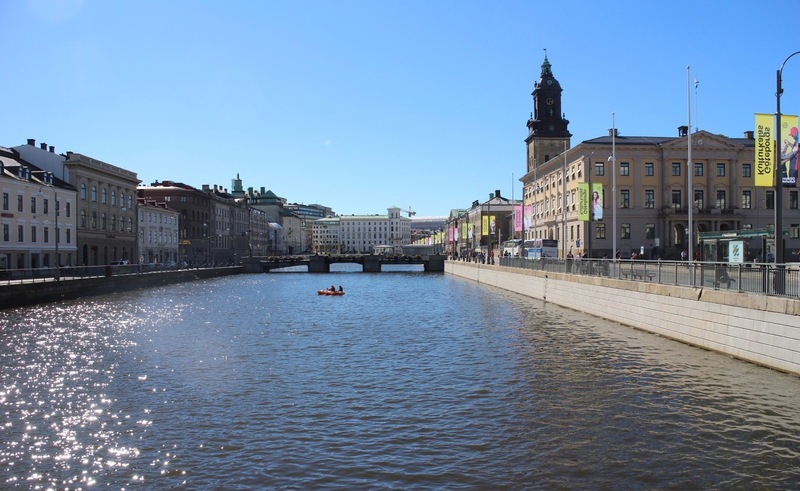 The first trade guild in Sweden had been established in Gothenburg in 1661 and a new organisation for the city's merchants was established in 1781. They initially met in the town hall before the purpose-built house was completed, replacing an aristocratic residence, known as Kaulbarska huset. The municipal building on the left was originally completed in 1759 after previous buildings burned in 1746 and 1758. The design was probably by Bengt Wilhelm Carlberg, though the top-storey was added during a rebuilding in 1823. Further left stands Wenngrenska huset, built as a residence in 1760, again by Bengt Wilhelm Carlberg, with a second storey added in 1820. The city began to demolish its 17th-century bastions and walls in 1807 and new buildings were completed within the moat in the 1850s. Many of the new houses on Stora Nygatan were by German-born architect August Kruger, including the synagogue from 1855. It passes Bastionplatsen, which was named after one of the former bastions, Gustavus Magnus from 1686-93. Its most prominent building was completed in 1905-08 by architect Hans Hedlund. A green belt named Kungsparken was established on the opposite side of the moat, where a theatre was built in 1856-59 by architect Bror Carl Malmberg. Two previous theatres had been created in 1814-16 and 1819, but both went out of business fairly quickly. 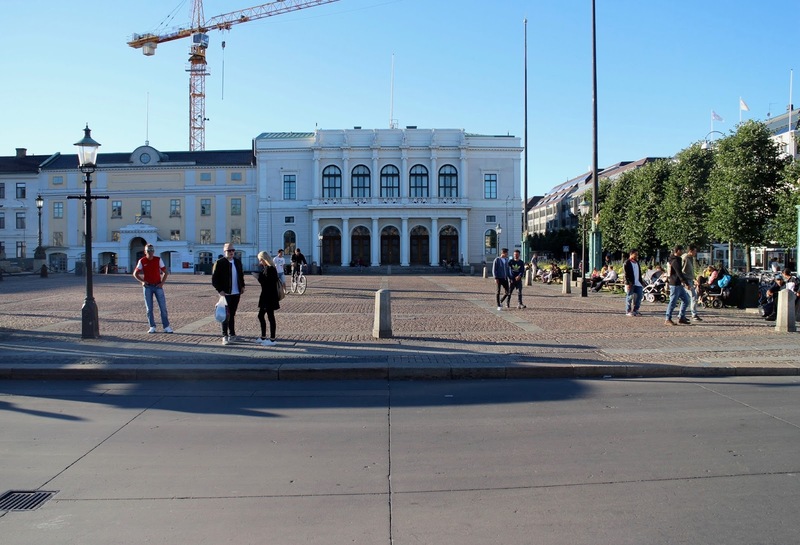 A listed company was created in 1855 to finance the new theatre and the site in Kungsparken was offered for free. The building on the left is from 1883 (or 1890), by architect Hans Hedlund, for Sweden's shipowner's association. A competition was held in 1861 to arrive at a master plan to expand the city beyond the moat. Two proposals were chosen to form the basis of a plan that was finalised in 1866. Central in this plan was the boulevard Kungsportavenyn, which stretches for about 1,000 metres from the moat to Gotaplatsen, where most of the buildings were only completed in the 1920s and 1930s. Engelska kvarteret, or the English quarter, were the first buildings of Kungsportavenyn. These were terrace houses designed in 1872 by architects Johan August Westerberg and August Kruger. The fish hall, generally known as the fish church due to its resemblance to a gothic cathedral, was completed in 1874 to a design by architect Victor von Gegerfelt. The idea to build a hall for the fish market, which had been moved from Gustaf Adolf Torg to Rosenlundkanalen in 1849, was first proposed in 1870. 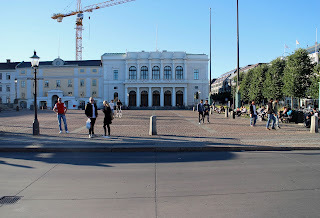 The building on its left is Rosenlundshuset from 1968-70. 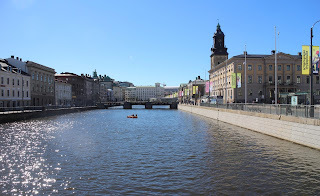 On the other side of the canal is the district Haga, which was established already in 1660. It became a working class district consisting mainly of wooden houses in the 19th century but was heavily rebuilt in the 20th century. The church is from 1856-59 by Adolf Edelsvard and the district also includes the 16th century fort Skansen Kronan. Handelsinstitutet was built in 1881-82 to a design by architect Adrian Crispin Peterson. The school had been founded in 1826 as the first business college in Sweden. It moved to a new building in 1915 and the building is now in use by Gustaviskolan, an elementary school. The triangular square Vasaplatsen is one of the main features of the 1866 masterplan. A few wooden houses were first cleared, the square was named in 1882, the fountain was completed in 1897 and mansion blocks sprung up around it in the period 1890-1905. Some of the names associated with the area are architects Johan August Westerberg, Hjalmar Cornilsen, Hans Hedlund, Adrian Crispin Peterson, and his son Carl Crispin. To the south stands the main building of Gothenburg University, which was completed in Vasaparken in 1907 by architects Ernst Torulf and Erik Hahr. The building on the corner of Sodra Larmgatan and Magasinsgatan was built in 1902-04 to a design by architect Isak Gustaf Clason, though the plan is signed Ernst Kruger. It was built for wine merchant C. G. Platin. The two lower stories were for storage, shops and offices, while the upper stories were originally flats. On the left are the old artillery stables from 1835, where Goteborgs Hyrverksaktiebolag, which served the city with horse-drawn taxis, built an iron shed in 1898. The building on the right is from 1935, by architect T. Svanberg, reclad in 1966. A number of banks were built in the late 19th and early 20th centuries on Sodra Hamngatan, after the Swedish central bank built its Gothenburg branch here in 1886, to a design by architect Viktor Adler. The building on the left was built for Goteborgs Kopmansbank in 1891 by architect K Johnson, the pedimented facade is by Ernst Kruger and was built for Goteborgs handelsbank in 1904-05, while the building in between was added for Nordiska Handelsbank in 1921, by architects Arvid Fuhre and Conny Nyquist. Furthest to the right can also be seen Skandiahuset from 1909-11, built for the insurance company Skandia, by architect Gustav Wickman. The modern facade is from 1980 and is by White arkitekter, replacing five merchant houses from the early 19th century. The house under renovation is Chalmerska huset from 1807. Esperantoplatsen was named in 1954 and consists mainly of old warehouses and former industrial buildings. The square also features remains of the old fortifications of Gothenburg, which were begun in 1624 and mostly demolished in 1807-17. The surviving section was part of the Carolus Rex bastion, one of the 13 polygonal bastions that surrounded the city. Most of the buildings in this western section of the old town are from the early 20th century due to the hilly topography, which delayed urbanisation here. The narrow stretch between the hills Otterhallan and Kungshojd is now part of Kungsgatan and was one of the entrances to the city, via the now-demolished Karlsporten. The 1866 masterplan essentially covered the districts of Vasastaden and Lorensberg, which were mostly built up between 1870 and 1920. Vasastaden was given its own parish when the Vasa church was completed in 1905-09, to a design by architect Yngve Rasmussen. A new plan for the completion of Kungsportavenyn and the villa area of Lorensberg was finalised in 1910 and realised by 1934. The general post office was built in 1917-25 to a design by architect Ernst Torulf, and was considered the most expensive building in Sweden at the time. It was turned into a hotel and conference facility, with the addition of a modern tower, in 2012. The architects behind the conversion were Semrén and Månsson. Lilla Bomman is an 86-metre tower built in 1986-89 to a design by architect Ralph Erskine, in collaboration with White Arkitekter. It was originally built as the head office in Gothenburg for the construction company Skanska but is now owned by Vasakronan AB. The tower is often known by its nickname, the lipstick. Gothia Towers are three high-rises built between 1984 and 2014. The original tower was 63 metres tall and was increased to 82 metres in 2012-2013. The second tower was completed in 2001 at a height of 77 metres, while the construction of the third tower began in 2012. It reaches 100 metres and is currently the city's tallest habitable building. The design of the latest development of the complex was by White arkitekter. A fourth tower is also being planned. The Gothenburg Opera was built in 1991-94 to a design by architect Jan Izikowitz of architects Lund & Valentin. A number of different sites had been debated since the 1960s and a decision had been made in 1985 to build at Gamla Ullevi. A design by architect Carl Nyrén was recommended in 1986 and was supposedly quite similar to the opera that was finally built by Izikowitz.